No. HDMI to VGA Converter only converts the HDMI signal to VGA signal. Yes, it works with all generations of Apple TV. Press and hold both the Menu and Up buttons on your Apple TV remote control until the LED indicator on the Apple TV box flashes. The LED flash lets you know that Apple TV is entering Black Screen Recovery mode. Apple TV will cycle through several resolutions to find the best match for your display device. Please allow 3 to 5 minutes for this process to complete and for an image to appear. iPad mirroring is only supported in later models like iPad 2 and 3. You can only stream limited contents like music, videos and photos with your original iPad. 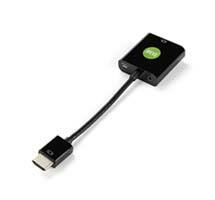 Yes, HDMI to VGA Converter works with HDMI devices including PC, MAC, Playstation 3, Xbox 360... etc.